What is NAFTA? • Why change it? • What did Trump want a new NAFTA to look like? • The metal wars • What about Mexico? • Contentious issues for Canada • Chapter 11 vs. Chapter 19 • Who’s deciding NAFTA's future? • How could this affect me? • What about the rest of the world? • What’s next? For 24 years, the North American free-trade agreement tied the continent’s economy together – until Donald Trump, the “America First” president, promised to unravel it. For 14 months of dramatic negotiations, the U.S. argued with Canada and Mexico about what a new deal would look like. Mr. Trump threatened several times to rip up the deal altogether, or cut separate deals with the other countries. Finally, Canadian and U.S. officials reached an agreement just before Mr. Trump’s latest of several deadlines. The new deal – dubbed the United States-Mexico-Canada Agreement, or USMCA – still needs to be finalized by the three countries' legislatures, but Mr. Trump and Mr. Trudeau are hailing it as a major breakthrough. Starting in January, 2017, The Globe and Mail kept a rolling guide to the trade file and the issues at stake. Here’s a full recap of the events leading up to the USMCA announcement. The 1994 agreement – an expanded version of a Canada-U.S. free-trade deal from 1988 – created what was then the biggest free-trade area in the world. It removed barriers to the flow of goods and labour between Canada, the United States and Mexico, under the oversight of an independent dispute-settlement process. Canada – the world’s largest purchaser of U.S. goods – saw its exports to U.S. markets soar. The Americans are less dependent on NAFTA than Canada is, The Globe’s Steven Chase explains: Trevor Tombe, a University of Calgary economist, calculates that there are only two American states – Michigan and Vermont – where trade with Canada exceeds 10 per cent of their annual economic output. 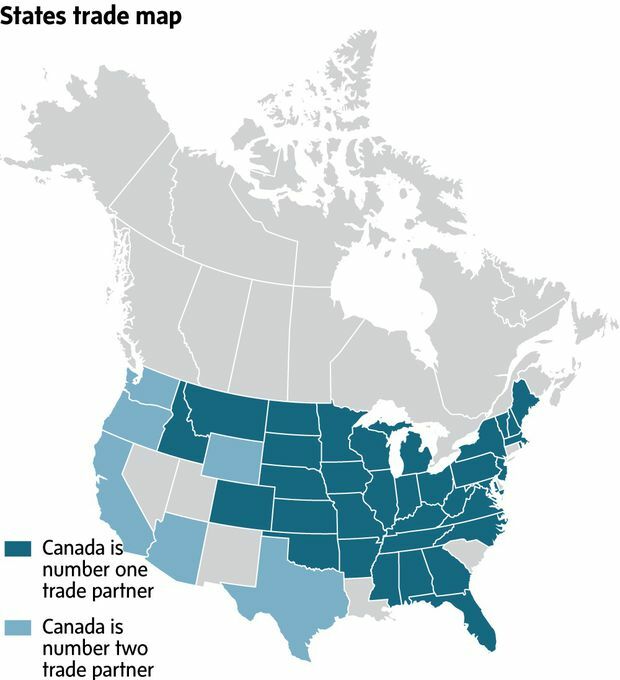 There are only two U.S. states – Michigan and Vermont – where trade with Canada exceeds 10 per cent of their annual economic output, according to University of Calgary economist Trevor Tombe. For years, the Canadian government has repeated its claim that Canada is the most important foreign market for 35 U.S. states. This map is posted on a government website that promotes trade. 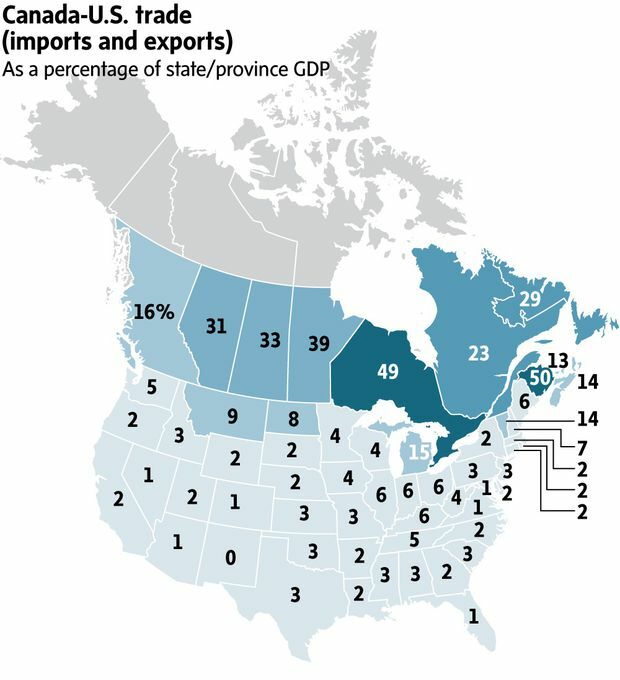 This map, using data retrieved from the U.S. Census Bureau, shows Canada’s share of total U.S. exports, by state. It shows that, for a majority of states, less than 30 per cent of total exports go to Canada. The politics of free trade underwent a remarkable U-turn in the decades after NAFTA came into being. In 1988, Canada had a Progressive Conservative prime minister, Brian Mulroney, who fought an election over the Canada-U.S. trade deal with the Liberals opposing it. He also had pro-free-trade Republican allies in the White House, with Ronald Reagan and later George H.W. Bush, backing him up. Contrast that with 2016, when protectionism turned into a defining theme of the U.S. election. Both presidential candidates opposed the Trans-Pacific Partnership, a trade deal even bigger than NAFTA, but the Republican Mr. Trump also singled out NAFTA and promised to erect a wall along the U.S.-Mexico border. In his inauguration speech, Mr. Trump promised an “America first” attitude to trade, immigration and foreign affairs. What did Trump want a new NAFTA to look like? In its initial months, Mr. Trump’s inner circle strongly disagreed about what demands to make in NAFTA renegotiations. There was a moderate camp, including Treasury Secretary Steve Mnuchin and Mr. Trump’s son-in-law Jared Kushner, that wanted to enhance NAFTA and make cross-border business easier for corporations, and a protectionist camp, including former chief strategist Steven Bannon. The protectionist camp has been more dominant in recent months, especially since the March departure of economic adviser Gary Cohn. Reducing the U.S. trade deficit within NAFTA, which could mean increasing U.S. exports or reducing Canadian and Mexican imports. Scrapping NAFTA’s dispute-resolution panels, which have sometimes ruled in Canada’s favour on softwood lumber and other trade issues. Using “Buy American” provisions to bar Canadian or Mexican firms from seeking U.S. government contracts. Dairy: The U.S. wants an end to Canada’s supply-management regime for dairy and poultry products. Sunset clause: The U.S. wants the new NAFTA to expire in five years unless the member countries agree to renew it. Could Trump really pull the U.S. out of NAFTA? Building barriers (both physical and economic) with Mexico was Mr. Trump’s stated goal since he began running for president. In the 2015 speech announcing his campaign (the one where he said “rapists” and criminals were coming across the U.S.-Mexico border), he said Mexicans were “laughing at us” and “killing us economically.” Mr. Trump’s election put Mexico’s then-president, Enrique Pena Nieto, in a tight spot: He faced domestic pressure to stand up to Washington about the wall that Mr. Trump wants Mexico to pay for (which Mexico refuses to do), but he also had to avoid alienating a major trading partner and being shut out of the new North American trade regime. In July, Mr. Pena Nieto’s dilemma passed on to Andres Manuel Lopez Obrador, who won a landslide victory in July 1’s presidential election. The leftist leader, popularly known as “AMLO” from his initials, promised to avoid fighting with Mr. Trump and keep NAFTA as a bilateral agreement with Canada if the United States pulled out of it. But when Mexico, along with Canada, was targeted with U.S. steel and aluminum, Mexico retaliated with tariffs on products made in pro-Trump heartland states, such as steel, pork, fruit and cheese. For Mexico, the biggest issue of the NAFTA talks has been auto manufacturing. The United States wanted new requirements that 40 to 45 per cent of auto content in the NAFTA zone be made at factories that pay US$15 an hour or more, which is more than four times what the average Mexican worker makes. Mexico’s resistance to the auto proposal, which they fear would drive manufacturing jobs away from the country, kept the NAFTA negotiators at loggerheads for months, but on Aug. 27 Mr. Pena Nieto and Mr. Trump announced they had reached an “understanding” on the issue. It was this agreement that would get the ball rolling for a new trilateral deal with Canada. Canada’s dairy, egg and poultry industries are governed by a supply-management system that dates back to the 1970s. It has three parts, The Globe’s Barrie McKenna explains: Fixed prices, production quotas and tariffs to protect Canadian producers from foreign competition. The dairy tariffs – which run up to 270 per cent, and which Canada tightened in 2016 to include unfiltered milk products used to make cheese and yogurt – have been a thorn in the side of other dairy-producing nations like the United States, Australia and New Zealand. In the months that followed, the Trudeau administration spoke in strong defence of Canada’s dairy and poultry sectors. Then, in the fourth round of NAFTA renegotiation talks, the Trump administration put its demands on the table: Phase out all tariffs associated with dairy and poultry supply management over 10 years. Canada held firm for months, but by August, the Trudeau government was ready to offer some concessions. 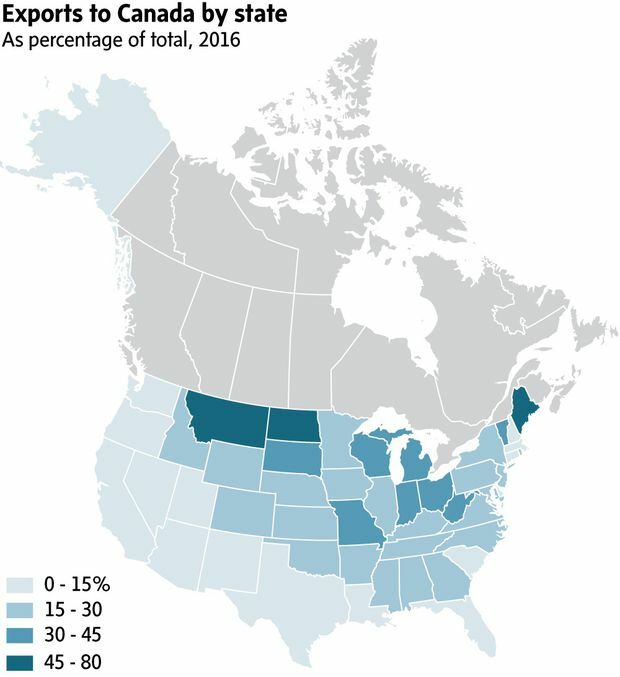 The USMCA, announced Sept. 30, gave the U.S. a percentage of the Canadian dairy market, much to the chagrin of Canadian industry groups and politicians in Quebec, who were in the midst of a provincial election at the time. Feuds over softwood lumber have been a recurring part of Canada-U.S. relations since the 1980s. Their root cause is U.S. industry’s contention that Canada unfairly subsidizes its lumber by providing cheap access to public land. It’s led to a cycle of American punitive action, followed by trade cases mostly won by Canada, and then a compromise settlement. The fifth and most recent lumber war was set off on April 24, 2017, when U.S. Commerce Secretary Wilbur Ross said his agency would impose new anti-subsidy duties on Canadian softwood. The initial duties added up to about 20 per cent, but a second wave of anti-dumping duties in late June brought that total to about 27 per cent. The U.S. International Trade Commission upheld the duties in a unanimous final ruling on Dec. 7, arguing that Canadian shipments of softwood lumber were hurting American producers. The Trudeau cabinet discussed an aid package for the softwood industry last May, but waited for provincial input from a special working group before announcing $867-million in aid on June 1. Ottawa gave the industry loan guarantees, help finding new markets for its products, employment-insurance support for workers and money for new initiatives from Indigenous forestry producers. Two of NAFTA’s dispute-resolution mechanisms were targeted for major changes. How is Chapter 11 different from Chapter 19? Here are the basics. Imagine a scenario where Country A passes a law that a corporation based in Country B feels would hurt its business. If Country B Inc. sues Country A’s government, the case goes to arbitration by an ad-hoc panel of lawyers appointed by the NAFTA countries, in a process set out in NAFTA’s Chapter 11. The idea is that these panels would be more independent than if the case were settled by Country A’s courts. But critics say the lawyers appointed to these panels risk conflicts of interest because of their business activities back home. Canada faced more Chapter 11 lawsuits than any other country – about 40 – most of which challenged its environmental protections and natural-resource policies. A 2015 study by the Canadian Centre for Policy Alternatives found Canada was the target of more than 70 per cent of all NAFTA investor-state claims since 2005, and study author Scott Sinclair warned that the problem was getting worse. One of Canada’s goals in the NAFTA renegotiations was to overhaul Chapter 11 so that, instead of ad hoc panels, there would be set rosters of judges appointed by the NAFTA countries. The USMCA elimited Chapter 11 for Canada and the United States, but left its protections for Mexico in a limited form. Whereas Chapter 11 laid out how companies can sue governments, Chapter 19 is for trade feuds between governments. If Country A imposes trade duties on Country B that B’s government thinks are unfair, B can appeal to an independent panel rather than seeking redress in Country A’s courts, which could presumably be biased in Country A’s favour. Canada liked this arrangement because it has used it to successfully challenge American duties on softwood lumber and other products. But the Trump administration thought the independent panels were a violation of U.S. sovereignty, and it wanted U.S. courts to handle trade disputes. Canada managed to keep Chapter 19 in the USMCA. Who was deciding NAFTA’s future? Here’s some more reading on key people involved in the trade file. David MacNaughton, Canadian ambassador to the U.S. Uncertainty over NAFTA’s future had far-reaching effects on the Canadian economy, from the dollar to the energy sector – and, ultimately, to your personal finances. Here’s some more reading on what might be coming. Michael Geist: What would a digital-economy-era NAFTA mean for Canadians? A new North American trade regime is only part of larger changes in America’s, and Canada’s, role in the world – and when NAFTA’s future was in question, Canada went looking for other sources of trade revenue. Asia-Pacific: Mr. Trump’s decision to withdraw the United States from the Trans-Pacific Partnership appeared to kill the trade deal, but 11 countries gave it a new lease on life with China’s help. In January, 2018, after months of diplomatic back-and-forth about what a new TPP should look like, high-level talks in Tokyo produced a revised version. The new deal, called the Comprehensive and Progressive Agreement for Trans-Pacific Partnership (CPTPP), needs to be approved by six of the member states before it can come into effect. Canada’s legislation to do so, Bill C-79, is still in progress in Parliament. Europe: The European Union, Canada’s second-largest trading partner, finalized a trade deal with Canada even broader in scope than NAFTA: the Comprehensive Economic and Trade Agreement, most of which provisionally took effect on Sept. 21. But it still needs to be ratified by all 28 EU member countries, and Italy, which elected a new government in 2018, has been resistant to that. Now that the text of the USMCA is apparently locked down, the legislatures of all three countries have to ratify it. Once Mr. Trump sends the text to Congress, it begins a 60-day countdown to a final signing. Prime Minister Justin Trudeau and Mexican President Enrique Pena Nieto were mobilizing their legislatures too. Canada and the U.S. have yet to finish negotiations that would end the punitive U.S. tariffs on steel and aluminum, which the Trump administration imposed in June when it was putting pressure on Canada and Mexico to sign a new deal.